BISHOP OF THE CATHOLIC DIOC. OF KOFORIDUA. Fifteen years ago the seed of St. Bakhita Catholic Church was sown at Old Estates, Koforidua. This seed has grown to become a big tree under whose shade the people of God sit. The Parishioners and Priests marked this milestone with a monthlong celebration. Among the activities organised were a pilgrimage to the Franciscan Valley of Prayer and Silence, a 5 Days Revival, Memorial Mass for deceased parishioners, a day with the sick and aged and free health screening over the period of the celebration. The anniversary was climaxed with a Thanksgiving Mass on October 28, 2018 presided over by the Local Ordinary of the diocese, Most Rev. Joseph Afrifah-Agyekum and concelebrated by scores of priests from the diocese. After the Mass, the Bishop blessed and commissioned the parish's new and ultramodern Rectory as the anniversary monument. 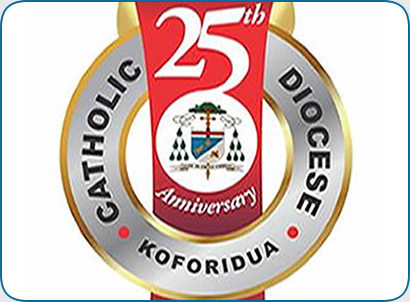 The Climax of the Silver Jubilee Celebration of the Catholic Diocese of Koforidua was held at Koforidua-Jubilee Park from November 23 to 26, 2017 with over ten thousand people participating in it. The Theme for the Silver Jubilee was: CDK @ 25: Renewing our Faith in the Light of the New Evangelization. Activities to mark the climax of the Jubilee included opening ceremony, anniversary durbar, presentation of awards, crusade, catechesis, candlelights and rosary procession, drama on the history of the diocese, appeal for funds, inauguration of an ultra-modern Diocesan Secretariat, Luncheon, and Eucharistic celebrations. On Thursday 11th May, Most Rev. Joseph Afrifah Agyekum and his curia held a forum with all Priests, Chairpersons of Parish Pastoral Councils (PPC), Parish Finance Committees Chairmen and Secretaries to the PCC from all Parishes and Quasi-Parishes within Koforidua Diocese. The Chief-Shepherd met these pastoral leaders to discuss the finances of the diocese and the need to strategize and work harder towards a self-reliant Diocese. Reverends Johnson Asigbey, Samuel Akrofi Dongotey were ordained on August 11, 2018 into the ministerial priesthood by Most Rev. Joseph Afrifah-Agyekum for the Koforidua Diocese. The well-attended ordination Mass took place at the St. Dominic Catholic Church, Adweso-Koforidua. In a homily, the Bishop expressed appreciation to the families, Parish Priests, Formators and all who played special roles in the formation process of the ordinandi.